Scientists at Aarhus University in Denmark studying the effects of climate change on weather-dependent electricity systems have found a silver lining in Earth’s otherwise fraught future outlook. Temperatures may climb and seas may rise, but the lights (and, undoubtedly, the air conditioning) will still be on in nations with high capacities for wind and solar energy. The research, published March 6 in the journal Joule, suggests that these electricity systems should work almost equally well in both historical and future European climates despite changing weather patterns. Using data from weather models and climate time series, the team developed models that predict wind turbine and solar panel output for all European countries under the most common global warming scenarios through the year 2100. 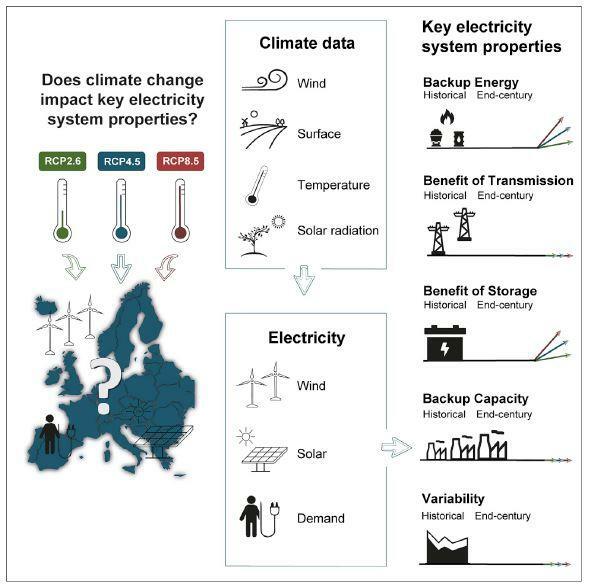 In order to compare how a European weather-dependent electrical grid functions in these projections with how it functioned historically, the scientists selected five key metrics: need and capacity for dispatchable electricity (which can be stored and used on demand by power grid operators), benefit of electrical transmission, benefit of electrical storage, and variability of electricity production and consumption. These metrics measure the most important aspects of a large-scale renewable-heavy electricity system and are abstract enough that the team could use them to draw general conclusions without focusing on a specific technology mix. Despite the new weather extremes predicted by future climate scenarios, the study didn’t find a large difference in the key metrics for renewable electrical systems, suggesting that system designs based on historical weather should perform similarly in future climates. Kozarcanin and his colleagues believe this is because current systems are designed to withstand extreme weather events–they simply don’t have to withstand them now as often as they will in the future. The team also notes that European demand for electrified heating and cooling will actually dip slightly as the climate warms, since the demand for air conditioning is much less than that for heating at European latitudes. This relaxed demand will counterbalance the slight decrease in wind and solar energy output their models predict. However, the team does believe that the European electrical grid will still require some tweaking to operate efficiently in the future. Transmission capacities are well developed within most nations, but the massive interconnected electrical system spanning 24 countries across Central Europe will need a boost to effectively transmit renewable energy between nations. “The main challenge for future grids will most likely be political and societal will to make the investments and proper planning for a grid topology that provides most of the potential benefit from smoothing renewable energy production between countries,” says Kozarcanin. If humans fail to mitigate the apocalyptic heatwaves and superstorms to come, at least it seems probable that we can hole up in our climate-controlled living rooms and watch HBO Nordic. Indefinitely. The authors were funded by the Aarhus University Research Foundation, the China Scholarship Council, the Idella Foundation Denmark, and the RE-INVEST project, which is supported by the Innovation Fund Denmark.